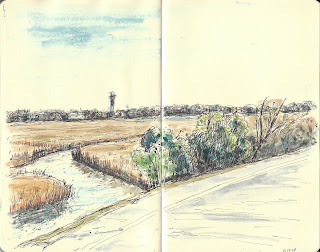 Taken from a parking spot and looking across the marsh toward the Sullivan's Island Lighthouse. This area is at the end of Pitt Street in Mount Pleasant and is known as the Pickett Bridge Recreation area. It's been pretty busy with with people fishing and crabbing any time that I have been there. Enjoy seeing your blog- these pastoral scenes and everyday scenes are great.